Keyboards are very tangible creatures, from the click and clack of mechanicals to the spongy feel of rubber domes. You can see the keyboard on your desk, just sitting there – and you know that you can create something with it, whether that be a novel, a song or an inspired play in a game. You can feel the weight of the keys, the heft of the chassis, the report of the switches. The inscrutable face of the Epic. 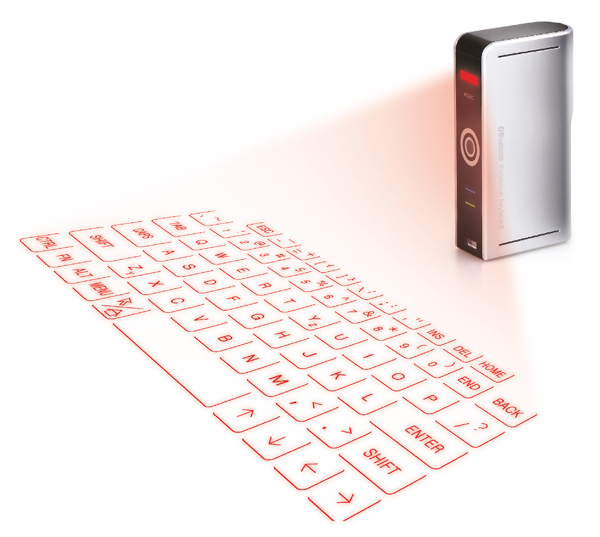 The Epic Bluetooth Projection Keyboard is rather different, then. The Epic begins as a small, discrete box made of silver and black plastic, about the size of a matchbox but a bit heavier. It feels solid and well made in your hand, but has no easily discernible purpose. With a flip of the on/off switch though, the magic happens. The Epic is a laser keyboard, which is to say it makes a keyboard appear on whatever surface it’s resting on. Visible lasers mark out the keys, while infrared light emitted from the bottom detects as each key is pressed. These keypresses are sent over Bluetooth to your device. 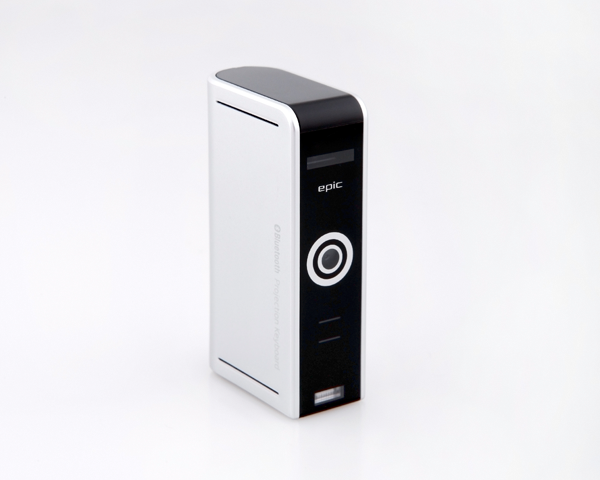 The Epic makes most sense paired with a smartphone or tablet, but any Bluetooth-capable device should work – including laptops and the PlayStation 3. The accuracy of the keyboard is variable. Initially I had a lot of problems getting key strokes to register, and without the tactile feedback it’s easy to drift away from your home row. But, as the company behind the Epic recommends, once you slow down and make sure you’re being accurate, you can then work back up into a more normal typing speed without sacrificing accuracy. The keyboard is designed to provide an easier typing experience, in places where a physical keyboard – however portable – does not fit or is too big and heavy to carry. While the grid projected is smaller than most physical keyboards, it’s a welcome upgrade from the cramped screens of even the largest smartphones and tablets. Better yet, by using an external keyboard like the Epic, your device no longer has to use up half of the display with an on-screen keyboard – so you can use all of your screen for reading the email you’re replying to, instead of peering through to glimpse only a few paragraphs at a time. The keyboard has decent battery life, lasting around two to three hours. Thankfully, its battery charges extremely rapidly, and it uses the same micro USB connector as most modern Android, Windows Phone and BlackBerry smartphones. Ultimately, a projection keyboard like the Epic will never be your primary keyboard. While the device’s accuracy is commendable and its operation fairly straight-forward, it’s hard to compete against the tactile feel and feedback of a physical keyboard. At the same time, the Epic makes a unique case as a secondary keyboard, allowing you to keep a full-sized keyboard in your pocket – and that’s pretty cool. A lean, mean keyboarding machine. Dimensions are 70 x 35 x 20 mm. 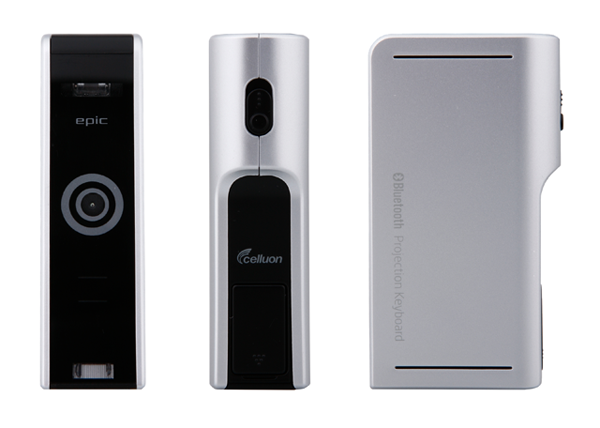 For more information on the Epic Projection Keyboard, check out the product page linked below. Feel free to leave a comment below with any questions or feedback, and thanks for reading!